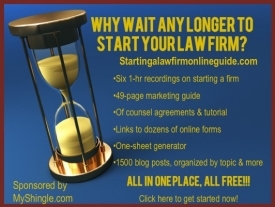 FREE Recording – Cold Calls for Lawyers! Yet for all the praise I’ve given the cold call, I’ve never offered a substantial nuts-and-bolts explanation of how to execute cold calls – for two reasons. First, though I’ve made cold calls myself with decent results, I don’t consider myself an authority on the subject. And while I’ve hunted for resources such as books or articles to better educate myself and my readers, I found most of the materials way too over-the-top salesy or pushy to recommend to other lawyers. So it was a matter of sheer luck when I became acquainted with Thomas Alascio , an executive recruiter in the Washington D.C. metropolitan area. For about four months this past spring and summer, Tom and I shared an office space in Bethesda, Maryland and because the space was cubicle-like in nature, I occasionally overheard Tom contacting prospective employers or employees. Tom was both affable and professional on the phone that he seemed like an ideal person to teach the how to’s of cold calling. –What are the benefits of cold calling? –What are some strategies for overcoming fear of rejection? –How do you get around gatekeepers like a secretary or assistant? –What’s the most important information to convey in the opening minute of the call? –How do you respond when a firm says it doesn’t have any overflow work or referrals? –What are some tips for using a cold call as a way to set up a meeting or lunch date with a lawyer in the community? To access the call, simply click HERE and enter your MyShingle password – or if you haven’t registered for the site, do so here – you’ll get the password immediately and can enter it to unlock the call. In a few days, I’ll also publish the written transcript if you prefer writing to audio.